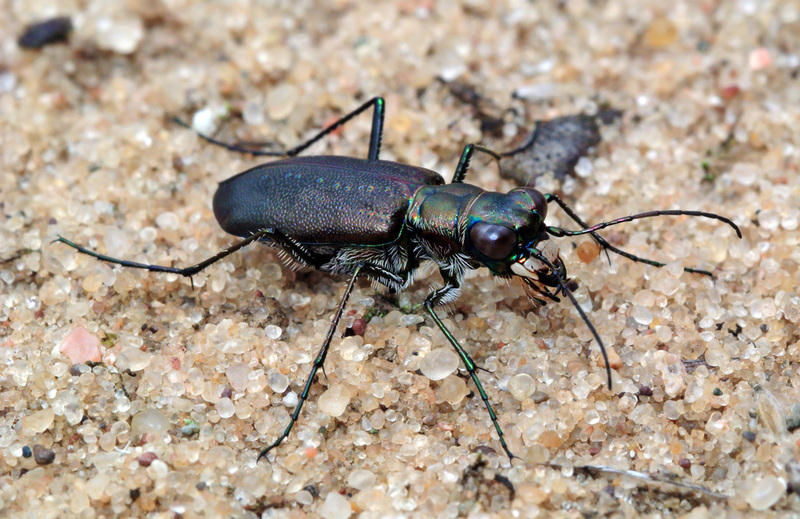 Today we have our annual selection of tiger beetle photos from reader Mike McDowell, whose notes and IDs are indented. Of a possible 16, this collection represents 8 of Wisconsin’s tiger beetles, mostly found in the southern part of the state. 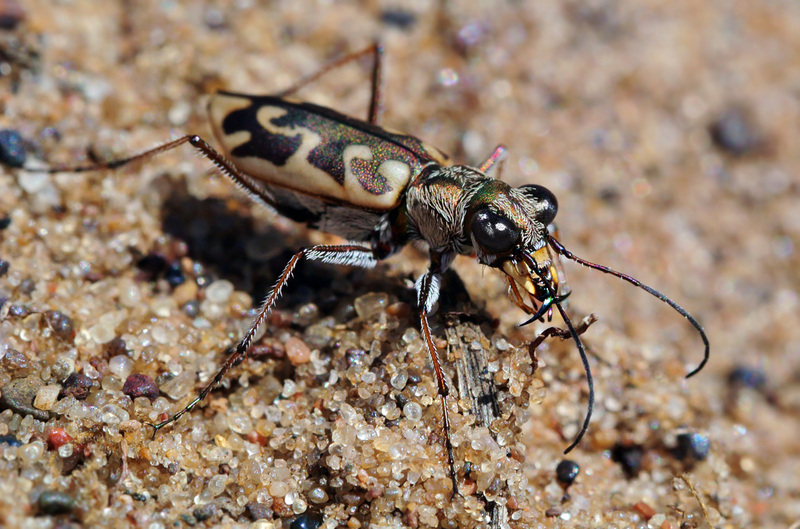 Others not included, like Boreal Long-lipped and Cow Path Tiger Beetle, require a trip further north, and the Splendid Tiger Beetle is a species easier to find in September. 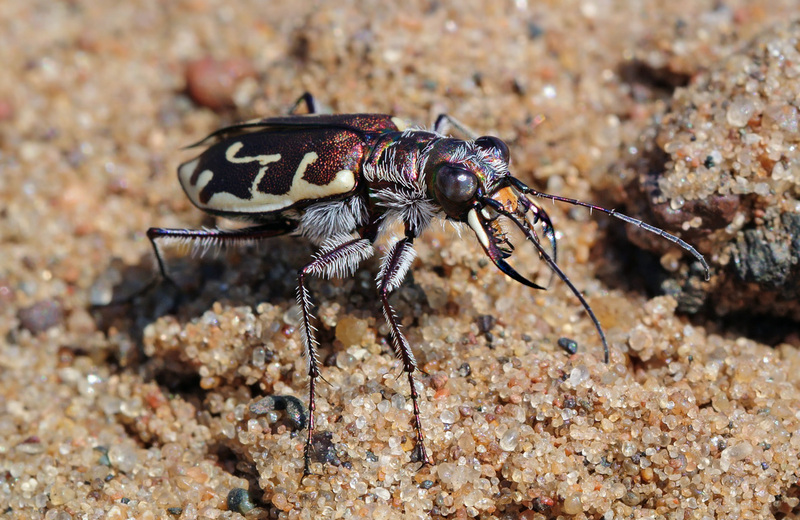 Anyway, I was super thrilled to find Ghost Tiger Beetles at a sandlot just 20 minutes away from my house (near Madison), which in past years meant a trip to central Wisconsin. All photographs were taken with a mirrorless Nikon, a 60mm Tamron macro lens, and a ton of patience crawling around on the sand. This entry was written by whyevolutionistrue and posted on July 5, 2018 at 7:30 am and filed under insects, photography. Bookmark the permalink. Follow any comments here with the RSS feed for this post. Both comments and trackbacks are currently closed. I like how the focus shows the various setae on each beetle. I always enjoy when a reader sends in arthropod photos. The skill level (and patience and persistence) needed to capture such beautiful images amazes me. Furthermore, I am always delighted by the diversity and strange beauty of the subjects. Thanks!! What great photos of spectacular creatures! I will have to look up tiger beetles–I know nothing about them. All very good! I have only 3 of your species in my immediate area: The six-spotted, punctured, and the festive. Our festives are a lot darker. And wow, that is fortunate to have ghost tigers so near. Spectacular! The first green guy is amazing. That you have English names for all of these species interests me because it seems that some insect (and other arthropod) groups do get names and some don’t. It is a function of interest by the public? For example, butterflies and odonates (dragonflies and allies), both very popular with the public, seem to all have common names. Thanks! There’s a field guide (David L. Pearson) for the 116 tiger beetle species of North America; all have a common name, but I’m not sure how they got them. It could very well be on account of public interest. 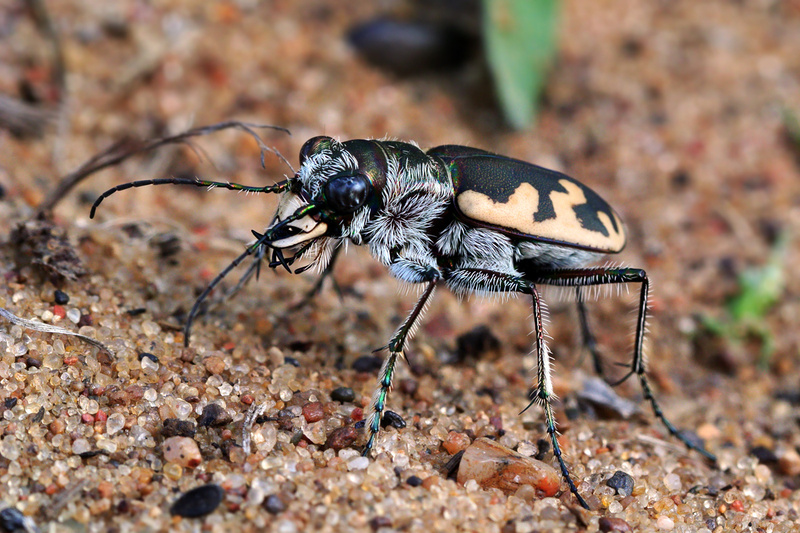 *116* species of *North American* *tiger* beetles? Wow. With significant variation within many species, as well as hybridization where some ranges overlap. The thing that works so well with this entry is the pics are practically like baseball trading cards – you could put the stats on the back – collect them all! … though, i am keenly aware, the analogy with baseball cards is so tenuous as to be non-existent. Nevertheless, I find it amusing. They do have the bright colours! A real treat, Mike. 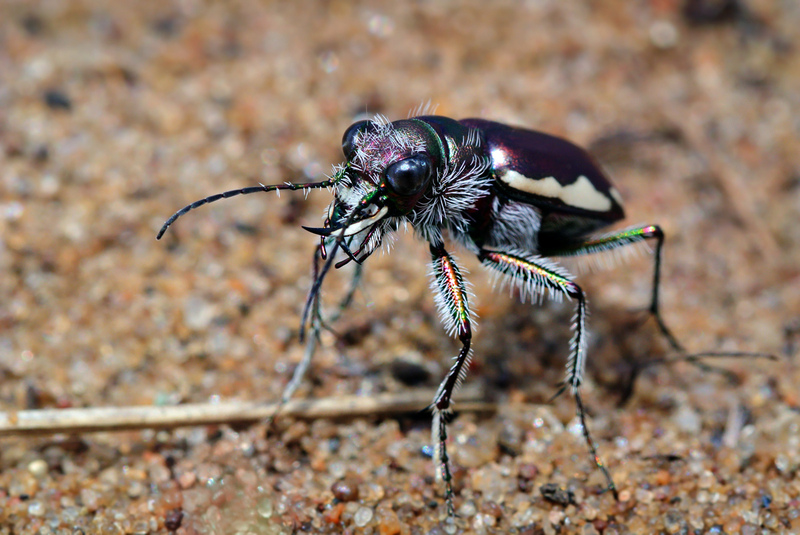 For those who don’t know tiger beetles, I can imagine spending an hour to catch one unawares: these are among the most visually acute and quick — on foot and on wing — of all beetles. Right up there with wasps and flies. And imagine scaling these beetles up — look at those jaws! 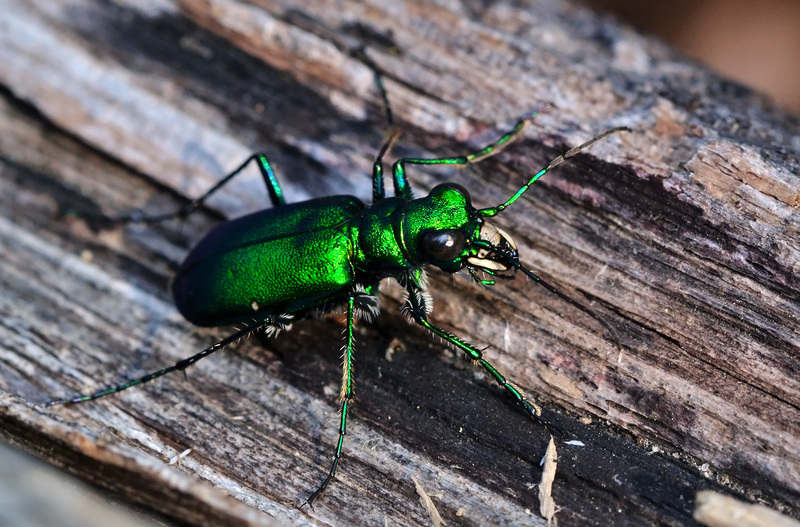 I recall reading that the typical tiger beetle action of run-fast-then-stop is necessary because they are so fast they outrun their brain’s ability to process the visual information they’re getting. They have to apuse to re-set. 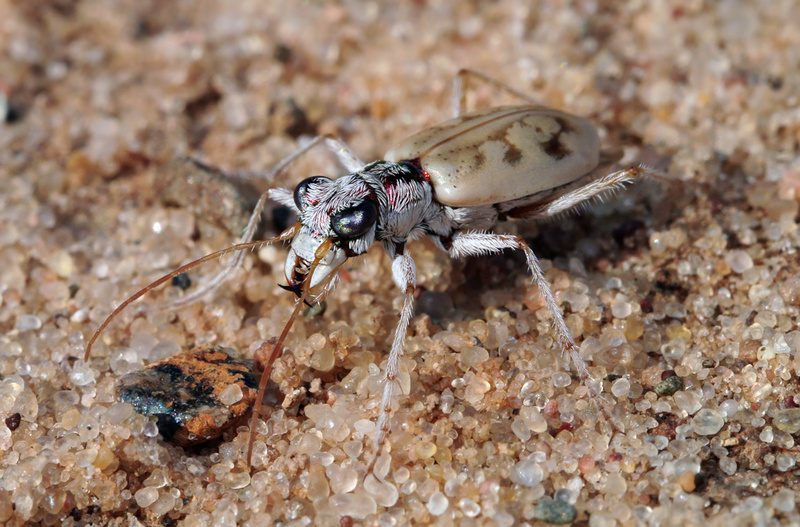 I used to enjoy throwing food items a couple of metres or so in front of tiger beetles, and watching them race up and grab it. Wow! Your patience crawling around on the sand paid off. The sand also makes a good background for these little jewels. The more i think of it, the more i think making trading cards of these and other RWP animals would be… well, great. Oh, gosh, these are magnificent, Mike! Thank you. Wow! 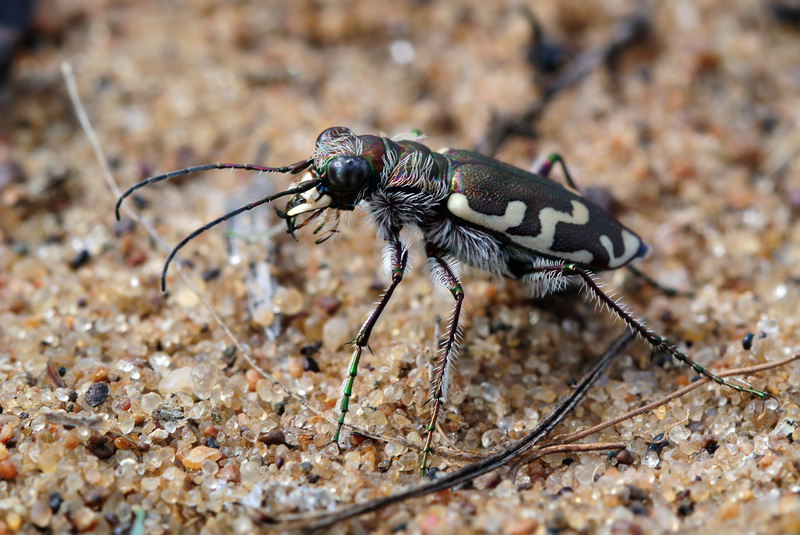 I never knew there were non iridescent-green tiger beetles. Those hairy ones with the beautifully marked carapaces are so striking. And all with those super impressive jaws!